monocrawl | A Weblog about.... food. It’s never easy saying goodbye, whether it be a long drawn out affair or short and sweet, there’s sure to be certain shared memories that are evoked that may lead to tearful moments and an occasional feeling of despair and hopelessness. Sometimes there’s the comfort of a return date to let you know that the goodbye is merely an intermission but when it’s indefinite it can be especially hard to take. Of course goodbyes are always made easier with alcohol as is life in general (I’m kidding kids), and what better way to signal the end of something then with a few pints of beer, a few shots of something on fire and a bunch of stupid ideas. It can turn something that is potentially sad into something fun, and if the few turns into a car load then it can be wildly ridiculous, just like the time I may or may have not made advances on my boss’s wife at a work function… but that’s a story for another time. When I heard the news that the Sydney monorail was being taken down I was hit with an immense feeling of sadness. I proceeded to spend the remainder of the day thinking about the glory of an eyesore that was those blue rails, about the automated voice that got you all excited that Sydney had a Spanish Quarter, about the monorail stop in Chinatown that never was, and all this accompanied by the constant soundtrack of ‘monorail, monorail monoooraaaaaiiiil… mono-doh!’. Later a friend of mine and I decided that the best way to say goodbye to this dear old friend of ours was with a monorail pub crawl, the idea being that we’d get off each stop and have a few drinks at whatever bar was close. The only thing we needed was a name. 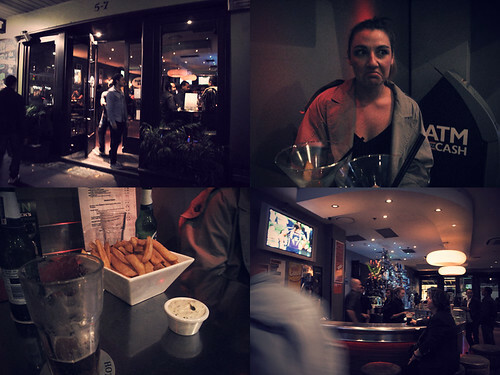 Clockwise from top left – Hello front door; Yes I’m sad too; Oh look its the inside; fatty fries and a surprisingly good aioli. And this, my dear readers is how I found myself out on a mildly chilly Saturday night embarking on #monocrawl2012. We start our evening at the highly trendy Hotel Coronation which sits right near the Galleries Victoria stop. Ok so it’s not the coolest place in Sydney and a place that attracts drunkards at a highly disturbing 7am on a weekday doesn’t scream inviting to non-locals, but it’s this diveyness that I find so appealing. We kick back with a few beers and, some gloriously fried in not canola oil fries and what’s great for me and not so much my company, F1 qualifying live on one of the TV’s. If sticky carpeted floors and memories of an 80’s Irish pub/ sports bar aren’t your thing then you could try going to The Arthouse Hotel. 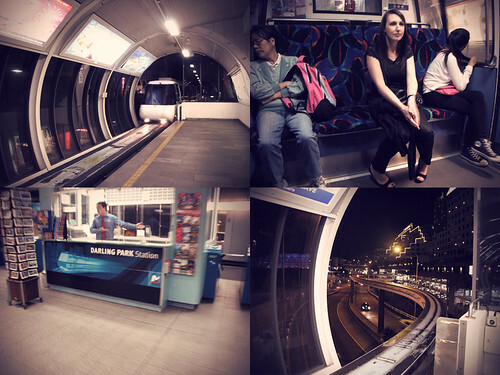 Clockwise from top left – It’s the monorail; Psychedelic seats and bored passengers; Poignant shot; What I see when I’m drunk. From here our night begins in earnest and we jump aboard the monorail. Now those of you from Sydney would be fairly familiar with how expensive a monorail ride can be ($5.00 for a single ticket), but if you’re smart about this then you’ll go and get yourself a day pass at $9.80 which allows you unlimited access for the day. At our next stop – the aptly named City Centre – we encounter our first hiccup of the night with the closest bar Kulabar looking to be no longer in business. We try going to St. James Hotel which is further up on Castlereagh Street only to find that that too is sadly closed. Realising we’re behind on time anyway we decide to get back onto the monorail. If you come across the same problem that we had then I might suggest that you try City Tattersalls, which is directly opposite the station. This sadly wasn’t an option for us as several people in our group lived within the 5KM radius that forces them to become members should they want to go inside. Left: The view from Helm; Right The view outside of Helm. Hello ladies. Never one to be down after a minor setback we kick on and head towards Darling Harbour, with the first stop of this precinct being Darling Park. Here we head into Helm Bar. It’s remarkably quiet for a Saturday night and lacking in character, but with its views of the harbour and an empty bar we weren’t about to start complaining. By this point I’ve switched to Gin and after buying a round of shots I find it amusing that due to a tequila aversion by one of the girls she decides to sip on it using a straw rather than knocking it back. It is an odd sight. If drinking in an overextended tin shed isn’t really your thing then you might want to try Pontoon around the corner, Cargo Bar on the other side of the aquarium, or if you’re feeling a little classy then at Coast above Cockle Bay Wharf. A quiet moment of reflection outside the Pyrmont Bridge Hotel. Memories. The closeness of the next stop reminds us of how redundant the monorail is. At only a few hundred metres away it would have made more sense to walk across the Pyrmont Bridge (affording us time to get sober), but what’s a monocrawl without a monorail? 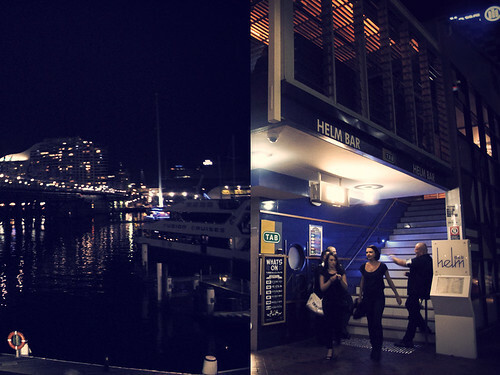 Like the good sports we are, we get back on and head to our next Destination the Pyrmont Bridge Hotel. In the past I’ve always avoided this pub as I always saw it as the seedy 24 hour joint in Darling Harbour. 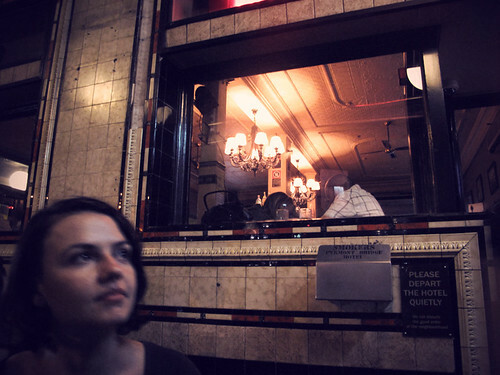 I’m pleasantly surprised to be greeted by friendly bouncers (going beyond their call of duty to find extra chairs for other patrons) and an interior lifted straight from the 1920’s that wouldn’t look so far removed in uber trendy Surry Hills/ Darlinghurst. If however, you can’t get past these reservations then you may want to try heading inside Harbourside and going to Cohibar where you can sit back with an excellent cocktail while puffing on a very fine cigar. 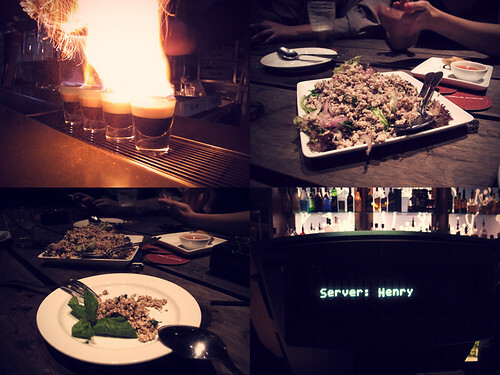 Clockwise from top left – The Flaming Charlie; Larb so good from Mrs’s Chans, Being creepily served by me; Larb so good I had to throw in another shot. With the next stop being even closer in proximity – Convention – and with us running behind on time and being fairly intoxicated we decide to bypass it and head towards the Paddy’s Markets stop where we stroll towards Charlie Chan’s. Ok so technically this isn’t the closest bar and if you wanted to stick to the rules then you may want to try going over to the Market City Tavern, but Charlie Chan’s (or Chacha’s as I affectionately call it) happen to serve one of my favourite drinks in Sydney, the amusingly named Flaming Charlie (fits in with the Simpson’s theme as well), a layered shot of drinks that I can’t remember that’s set aflame and further ignited using cinnamon powder. Feeling overly tipsy we order some food from Mrs Chan’s (by Crocodile Senior), a lovely plate of larb gai and some vegetarian spring rolls. The food sits well in our stomachs and perhaps I’m a little drunk at this point as I believe it to be the best larb gai I’d ever come across (will have to go back and retry it in a sober state). I guess the cute waitress didn’t hurt either (although the rejection kind of did). Unfortunately we spend a little too long inside and therefore miss the last monorail and with it our last monorail stop, World Square. Had we made it we could have tried going to Shark Hotel and ordered some fried ice cream from Holy Basil, or we may have walked on over to Mr B’s where we would have experienced a little bit of Bangkok in Sydney. From there the monocrawl was over but my night had only just begun. Begun to get stupid that is. A brief summary would include karaoke, copious amounts of something alcoholic mixed with green tea, a drunken meal of bibimbap at 4 or 5 am and an all day vomiting session the day after, by which point I had fallen completely off the rails. So just like any other farewell then.